First, I am thrilled to have a reason to write an open letter. All the cool kids are doing it. Please feel free to flame me, because I’m sure that we could both use the publicity. Second, I have free gifts. The first, obvious one, is the opportunity to meet me in person, even though I’m nobody, and I’ll just be tweeting lame stuff from the audience. But I plan to redeem myself with free t-shirts, buttons, business cards and a special gift for Deb Rox. I don’t even know her, but that is what the internet is for — to be creepy with people that you’ve never met. And for those of you who are staying home (what?! ), a little explanation: I’m going to the first ever social media conference for gay people on Friday and Saturday. I think they are letting some straight people in, but not too many, because it’s really cool now to be gay and we want to keep it to ourselves. It’s exclusive. And by that I mean sophisticated. Which is why I’ll be wearing this new shirt on the red carpet. I’ll look like this, only I won’t be standing in my bathroom (ideally). And as I’ve said before, I think this is the second gayest thing I have ever done. The first is getting into a long-term, committed relationship with a woman and having two kids. But that’s old news. What am I doing going to a social media conference? Well, I’m here so you can meet me. Or so I can meet you and tell people about it to improve my social cache. And I write this blog. And I’m on Twitter. And I’m writing a book about having babies (gaybies! ), because it seems like we’re all still confused about that. I am. And also because for a very long time, I didn’t think I needed to say anything about homophobia. But it turns out that I do. So I am. But I don’t have room for everything I have to say about it right here in this post. So I plan to take up one whole book talking about it. I hope you’ll read it some day. But until then, I’ll be on this blog trying to redefine the word “family” for the American people. That’s all. I hope you’ll stay in touch. Because this is an open letter after all. We can be pen pals, but on social media, because that’s what all the cool kids are doing. Now excuse me while I go and ride my giant ball attached to a chain and lick a hammer. Or tear up a picture of the Pope. Or possibly all three. 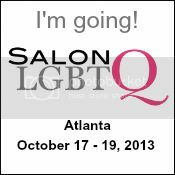 This entry was posted in Friends, Social Media and tagged gay social media, Salon LGBTQ, swag by Sarah. Bookmark the permalink. Sigh. I’m not invited 😉 Sounds like you are going to have a blast! Howdy! So very glad to have met you finally! Looking forward to much more (written from a stolen moment from inside said conference).